Matthew Murdock may be “the man in the mask,” but the true Devil of Hell’s Kitchen goes by a different name entirely; Wilson Fisk. Wilson Fisk has it all, money power, women, and a fleet of black s.u.v.’s for bashing in the brains of anyone who mildly irritates him. He also has arguably the most fashionable wardrobe of any Marvel villain to date. 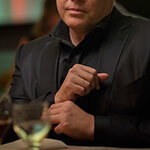 ​One of the first articles of clothing that you might notice about Fisk are his jackets. ​Here is a black, wool overcoat by Ralph Lauren that is an excellent match to the one worn by Wilson Fisk. Click here to take a closer look. Here’s a gray jacket that is nearly identical to the jacket worn by Mr. Fisk. ​This blazer in sapphire blue color is a perfect match to the style of Wilson Fisk. As I mentioned previously, Fisk has some of the most stylish items of clothing for a villain that we’ve seen thus far. ​So while we here at TVSG have painstakingly labored to find the most appropriate matches to the stylings of Wilson Fisk, I felt it was worth mentioning that none of the exact items are readily available to the public because they are handmade custom pieces. Anyhow let’s take a look at some of these vests. This Gioberti vest in royal blue color is nearly identical to the vest worn by Wilson Fisk during the first season of Netflix Daredevil. ​Another incredibly similar match is this Zicac men’s waistcoat in gray color. Click here to get one for yourself on Amazon. Wilson’s shirts, while visually stimulating at times, are likely the simplest articles of clothing that he has in his arsenal. ​He has been noted to wear multiple different colors of shirt (white, black, charcoal with pinstripes). His shirts are most often long sleeve button down dress shirts. ​This black Paul Jones dress shirt is a fine match to the style and color of shirt worn by Wilson Fisk. ​This white Van Heusen dress shirt is incredibly similar to the white dress shirt worn by Fisk when his love interest, Vanessa, is put in danger immediately after he promised she would be safe by his side. Whether you are building an accurate Wilson Fisk costume, or you’re simply wanting to add a hint of Kingpin style to your own wardrobe, you would be remiss to pass on Fisk’s fancy pants. ​Wilson’s slacks are coverings for his legs that generally match the color, style, and material of their corresponding jackets and vests to complete a three-piece suit. ​Although only his jacket has been confirmed to contain puncture resistant kevlar-like material, I’d say that it’s safe to assume that his entire suit has been tailored this way. ​These black slacks by Haggar are a stylish and simple set that match Wilson’s entirely. ​This set of Match Men's slacks in sapphire blue are an unmistakable match to the ones worn by Wilson. ​Last but not least, we have these Haggar dress slacks in graphite color that are nearly identical to the ones owned by Wilson Fisk. Wilson Fisk’s footwear not only serves the purpose of protecting his feet from the dirt and debris of the mean streets of Hell’s Kitchen, it also helps him to now and then kick the living hell out of anyone foolish enough to stand against him (such as Daredevil). ​These Ferro Aldo dress shoes in black match Mr. Fisk's pretty well. Wilson has been identified using a number of different accessories throughout the first season of the series. Let’s take a look at some of those items now. ​These cuff links aren’t an identical match to the ones worn by Wilson, but they match the general color scheme and look of the ones he does own. ​Here is a pocket square in black that’s a great match to the ones worn by Wilson Fisk. ​This black and gray Marca West patterned scarf isn’t quite an exact match, but it’s very similar to the scarf worn by Fisk after he removes his mother from her assisted living facility. ​This short sleeve Dickie's work shirt in white color is a perfect match to the corrections uniform Wilson Fisk is wearing in his prison cell at the end of season one. ​These white Dickie's utility slacks are a perfect match as well to the pants of the plain white corrections uniform. ​Not too much is known about the whereabouts of Wilson Fisk during the second season of Netflix Daredevil, or if he will be present in any capacity.